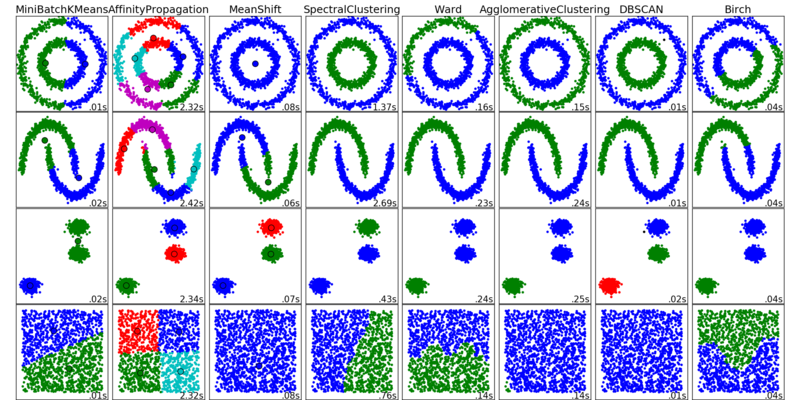 A loose definition of clustering could be “the process of organizing objects into groups whose members are similar in some way”. A cluster is therefore a collection of objects which are “similar” between them and are “dissimilar” to the objects belonging to other clusters. Clustering algorithms are usually unsupervised. How many groups (clusters) you want your data to be in? When you sort data in unsupervised learning you quite often ends up with looking good at the beginning. When you look at data from different perspective it’s not so great. Alghorithms only work when you tell them, how many groups you want data in. branching factor, threshold, optional global clusterer. Large dataset, outlier removal, data reduction. Clustering algorithms group a set of documents into subsets or clusters . The algorithms’ goal is to create clusters that are coherent internally, but clearly different from each other. In other words, documents within a cluster should be as similar as possible; and documents in one cluster should be as dissimilar as possible from documents in other clusters. Hierarchical clustering is where you build a cluster tree (a dendrogram) to represent data, where each group (or “node”) is linked to two or more successor groups. The groups are nested and organized as a tree, which ideally ends up as a meaningful classification scheme. 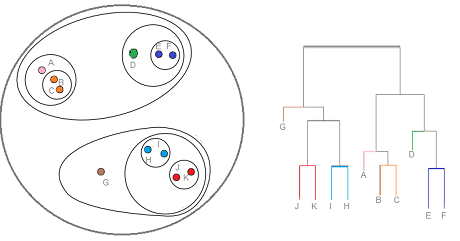 Each node in the cluster tree contains a group of similar data; Nodes are placed on the graph next to other, similar nodes. Clusters at one level are joined with clusters in the next level up, using a degree of similarity; The process carries on until all nodes are in the tree, which gives a visual snapshot of the data contained in the whole set. The total number of clusters is not predetermined before you start the tree creation. Dla zbioru Iris dokonaj klastrowania za pomocą alborytmu KMeans z biblioteki sklearn. Dla jakiego hiperparametru n_clusters osiągniemy najwięsze accuracy?